Let this ruby necklace, the warm hearted Angel of Love, help to replenish energy, passion and vitality. Wear the Ruby Angel Necklace for strength in adversity, to enthusiastically nurture the flame of Love, and to bravely follow your hearts true desires. Length 2.5″ Birthstone for Mar/Apr, Jul/Aug, Dec/Jan. Beautifully boxed, with sterling silver chain & printout. 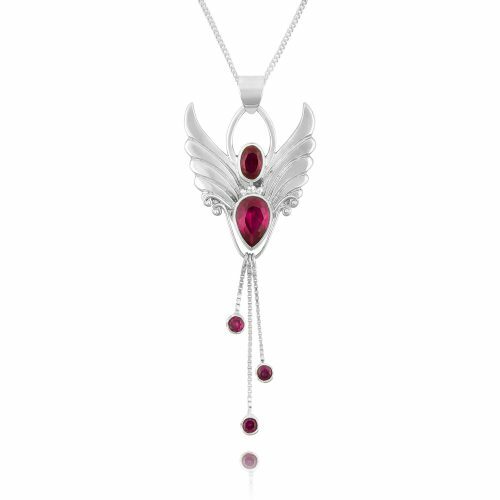 Our Guardian Angel, the Angel of Love is beautifully crafted in silver, and enhanced with gorgeous rubies glowing with inner fire. To send a subtle message of love, or, to awaken again your warm hearted, generous heart to love, let the Ruby Angel with her sense of vitality and discernment be your trusted confident, and your guide. Dancing ruby drops add a delightful movement to the piece, and a touch of intrigue.